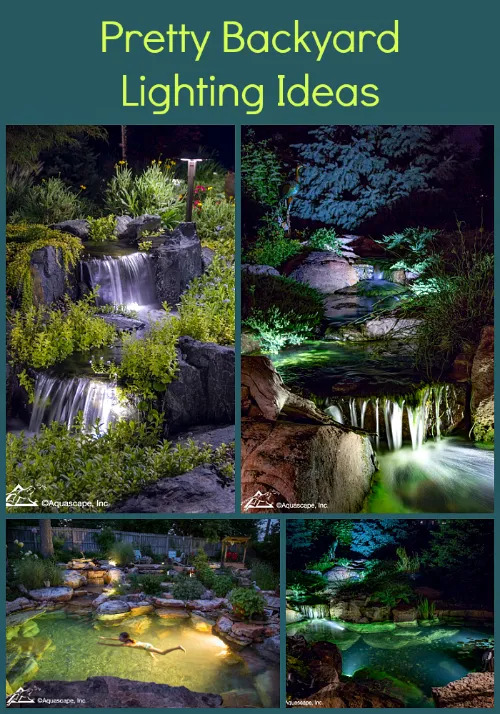 Pretty Backyard Lighting Ideas for Your Pond, Waterfall, or Fountain - Aquascape, Inc. 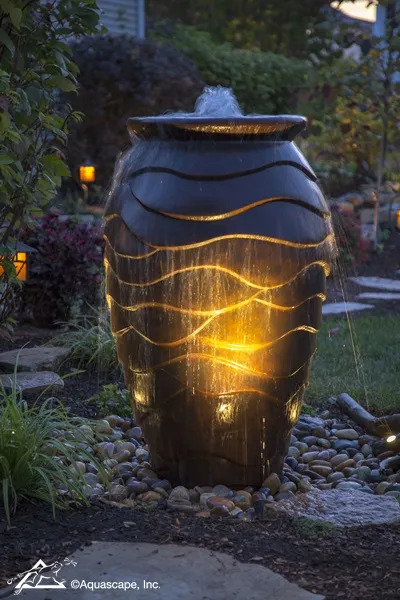 When you want to enjoy your water feature as the sun begins to set, be sure to add outdoor lighting. 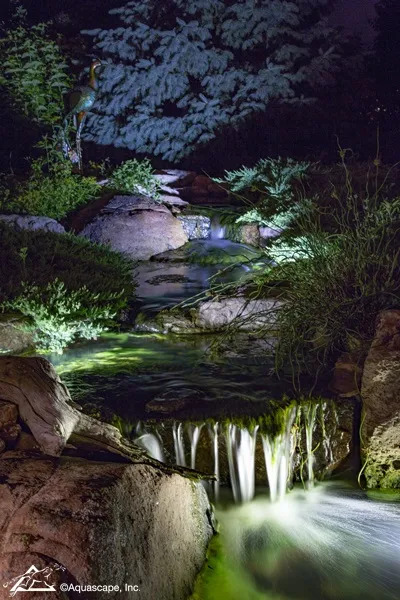 Most people think to add landscape lighting around a deck or patio, but don’t neglect your water feature for optimal nighttime viewing! 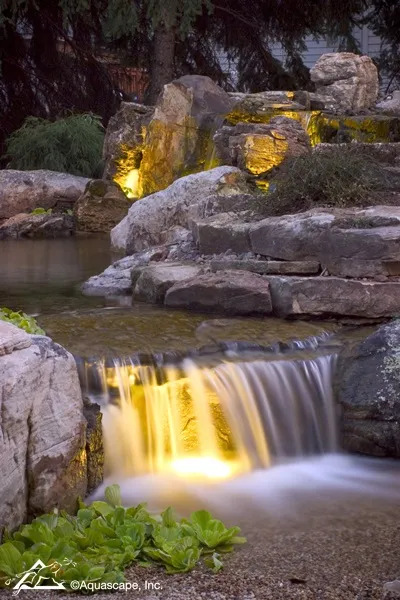 Here you’ll find pretty backyard lighting ideas for your pond, waterfall, or fountain. 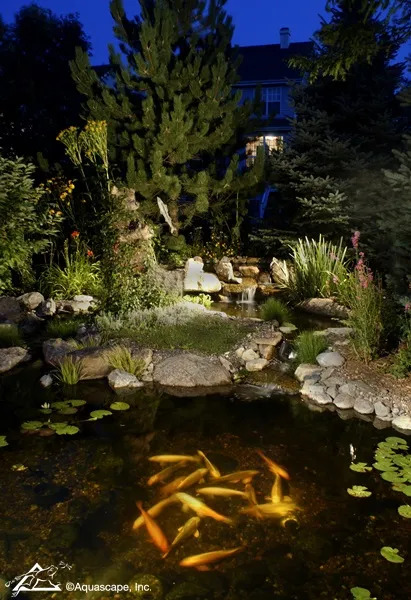 Add underwater lighting to a pond and you’ll enjoy seeing your fish swim at night. It’s almost magical watching them dart in and out of the lights. 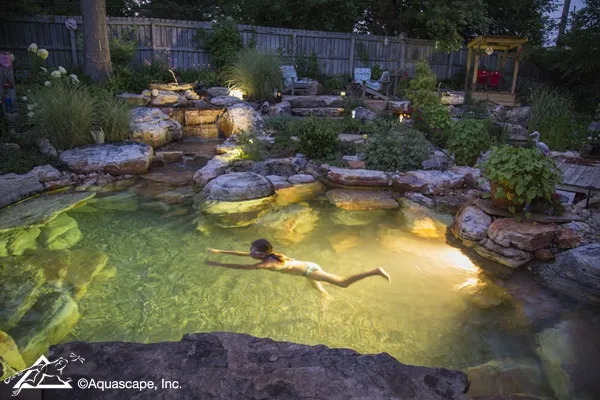 Underwater pond lights are a must for those with recreation ponds. 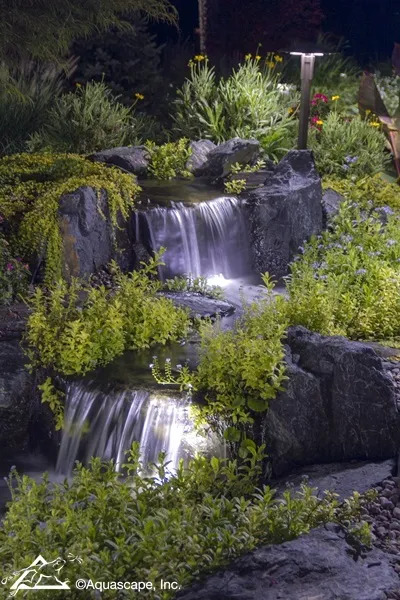 For a truly pretty effect add a waterfall light. 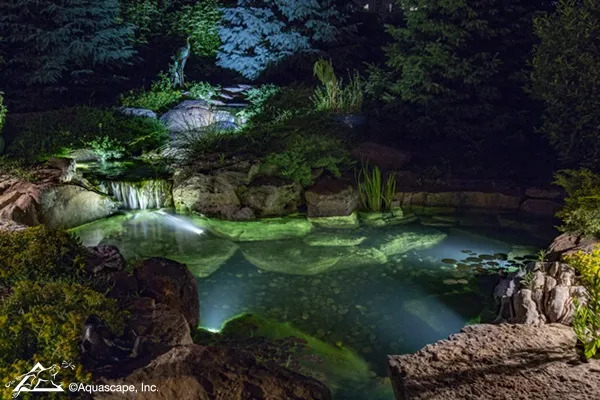 You’ll find your water feature takes on a whole new look at night. 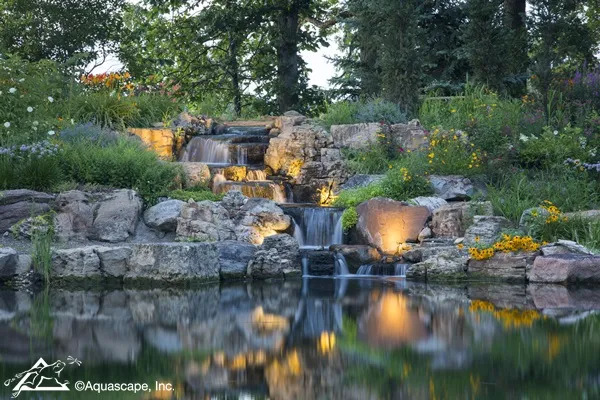 This waterfall on a large farm pond is used as a backdrop for wedding photographs. Spotlights are located at several points to show the depth and beauty of the falls. Place path lights at the top of the falls, and waterfall lights behind each drop of your waterfall. 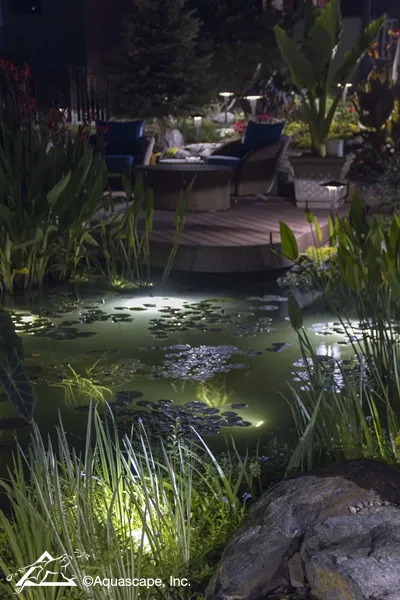 Remember to add small lights to a Patio Pond or container water garden. It looks equally pretty during the evening hours as it does during the day. 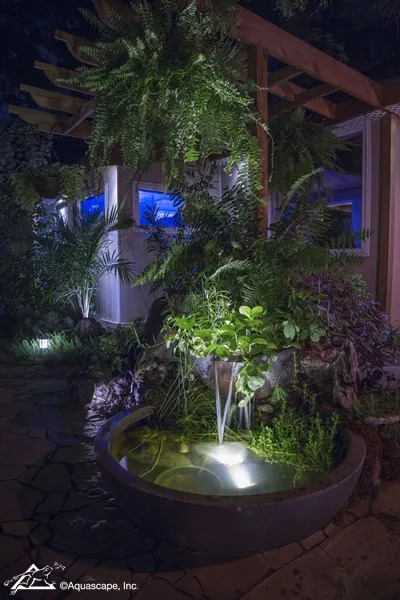 A small spotlight showcases a fountain in a front or backyard. 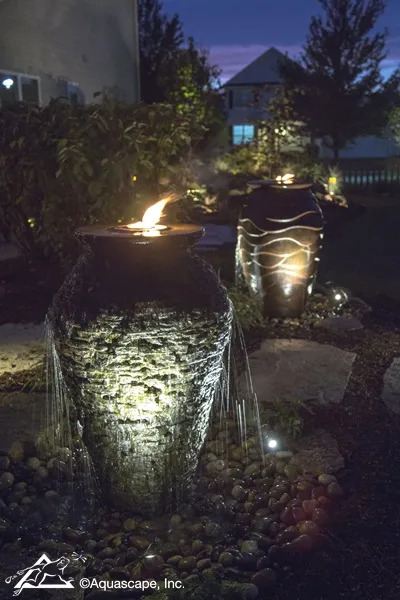 Another great backyard lighting idea for a fountain is to incorporate a small flame using the Aquascape Fire Fountain Add-On Kit. Everyone will ask how a fountain manages to maintain a pretty flame while the water is flowing.